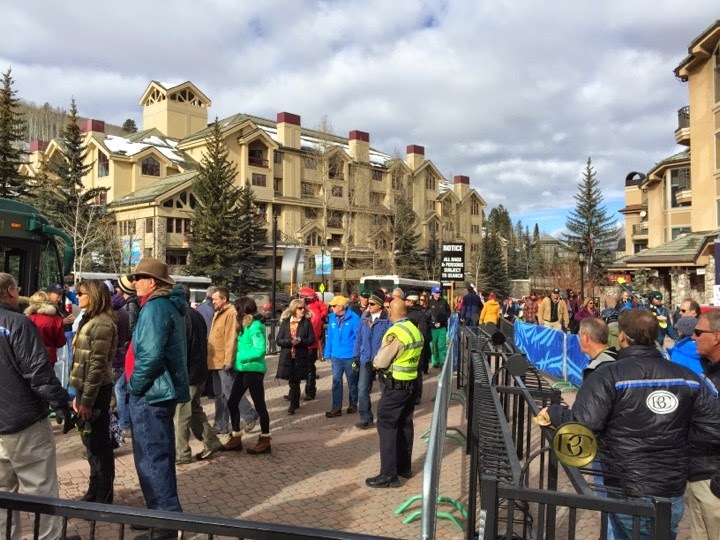 A campaign to create local awareness of the bag screening measures that will be in place during the 2015 Alpine World Ski Championships, Feb. 2-15, is being launched this week to help reduce congestion at the event venues. Spectators at the December Audi Birds of Prey move through bag check. Spectators will be limited to one bag per person. The bag must be smaller than 9 x 10 x 17” or 22 x 25 x 43 cm. and may contain items such as cameras, mobile devices, binoculars, cowbells, water bottles and snacks. Clothing and blankets are allowed if carried by hand. Après Avon, Championships Plaza at Solaris in Vail Village and Golden Peak Stadium in Vail. For safety reasons, the following items will be banned: illegal drugs, weapons, knives with blades over 3.5 inches, glass bottles, alcohol, umbrellas and air horns. Marijuana consumption is prohibited at the venues and will be strictly enforced. Informational fliers are available for distribution throughout the community by calling the Vail Police Department at 970-479-2100 or by download at http://vailbeavercreek2015.com/wp-content/uploads/2015/01/2015-BagCheckFlier.pdf. Chief Henninger also is asking community members to be alert and to report suspicious activity during the event as part of the “If you See Something Say Something” campaign. For event details, visit www.vailbeavercreek2015.com.